So far Gtmhub was allowing users to align (link) OKRs, but only within a given planning session (e.q. Q3 2017). 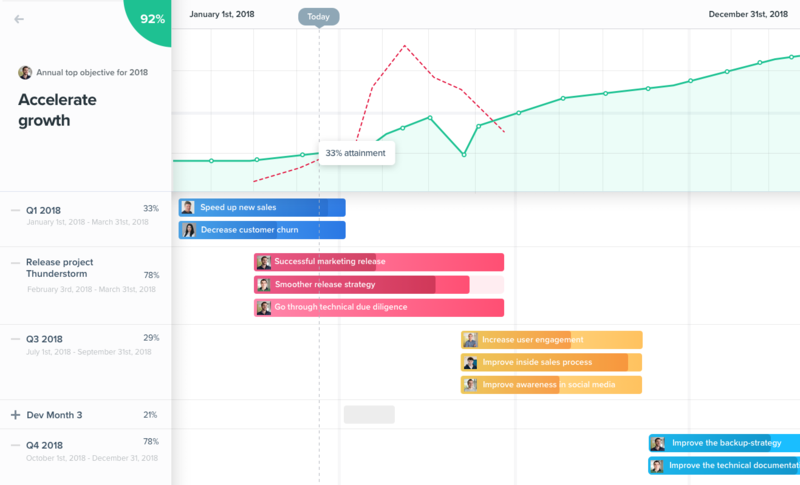 The new feature will allow you to align OKRs between planning sessions. A typical use case is for quarterly OKRs to support annual OKRs of the company. The new feature will also provide advanced reporting functionality that will show the correlation and impact of quarterly OKRs on the top-level company OKRs. At the moment, you can align child objective with a parent objective in Gtmhub. With this new feature, we will allow you to align child objective with a particular key result of the parent objective. We will make key results in Gtmhub more powerful by adding several optional properties which you will be able to define. Check-in date - at the moment, Gtmhub always uses current date for check-in. With this new feature, it will be possible to change this date, making it possible to have more precise progression charts. We will add ability to see a list of existing tags (not only typeahead suggestions). We will implement multiple improvements for the e-mail notifications related to updating manual key results. Ability to set default reminder for everyone in the planning session (e.g. every Friday). Currently, reminder has to be manually set for each key result. We will be sending personalized weekly updates to all users - showing the progress of the company, their team and their personal progress. Connector for Domo BI, which will allow users to use Domo insights as dynamic key results. We are aiming to add 5 new masterplans (the datasources yet to be decided), as well as provide 200 new out-of-the-box insights.